Summer Card Camp 2 from Online Card Classes started yesterday, and I decided to sign up at the last minute. I'm so glad that I did! I got so much inspiration just in day 1! Today's card is based on a sketch that they gave us, using a specified color combination. I'm also currently taking Studio Calico's Inked class (gotta love summer vacation), and I used the chevron stamp that came with that class for my card. I stamped it in three different colors, cut them out, and added a sentiment from Papertrey Ink's Flipping Out stamp set. 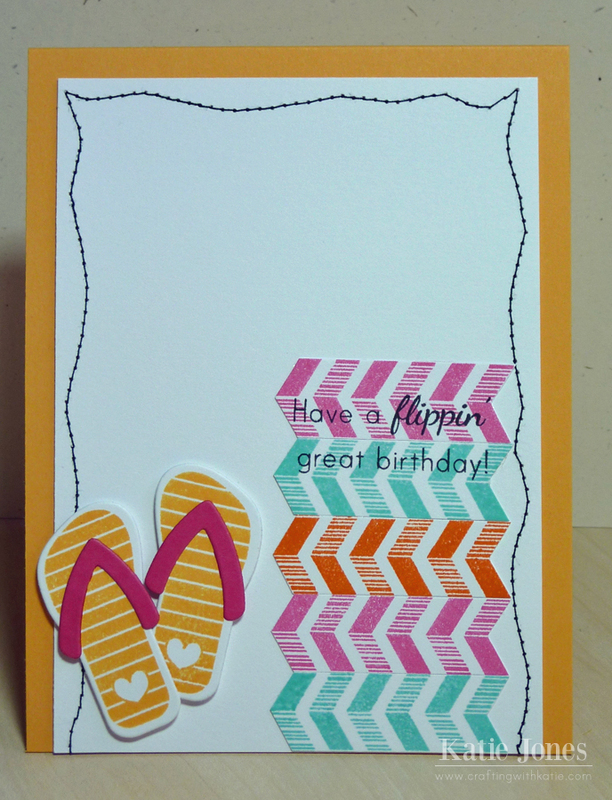 These cute little flip flops were made with the Flipping Out stamps and dies. I'll try to post more of what I make in these classes over the next few weeks. Also, don't forget that the HUGE new My Creative Time release begins tomorrow!!! I love the curvy stitched line! EEK! Super cute!!! :) Love those flippy flops! I'm also taking OCCSCC2 and I love your take on the sketch. See you in class! way too cute!! love it!